This past week Bob Arum of Top Rank mentioned that he’s interested in having Mikey Garcia (33-0, 28 KO’s), the current WBO super featherweight champion, facing his No.1 star Manny Pacquiao once Mikey moves up in weight in the future. The fact that Arum is talking about this fight tells you that we can expect that fight to happen very, very soon. Arum doesn’t have another pay-per-view presence in his Top Rank stable, and the 35-year-old Pacquiao is about the end of the line as a PPV guy in a year or two. We’re already seeing Pacquiao’s PPV numbers diminishing with his last fight against Brandon Rios. 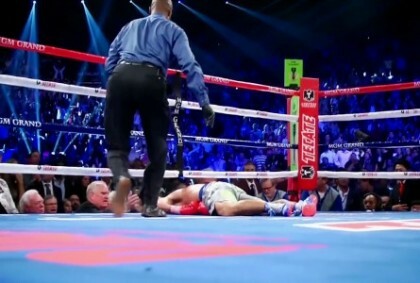 Was that just an aberration as a result of Pacquiao fighting in Macao, China, or a signal that fans are growing weary of him? I think fans have reached a saturation point of seeing Pacquiao fights, perhaps because of too many poor matches with him put in with guys that shouldn’t have been in the ring with him in the first place like Brandon Rios, Antonio Margarito, Shane Mosley, and Joshua Clottey. But Arum does need another PPV fighter, and Mikey looks like the guy he’s hoping can be the next big money guy in his stable. Mikey will be fighting for the last time at super featherweight this month against Juan Carlos Burgos (30-1-2, 20 KO’s) at the Madison Square Garden Theater, in New York, New York, USA. After this fight, Mikey will go up to lightweight, where he’s expected to fight once and then move up to light welterweight to be in position to fight Pacquiao. Pacquiao’s contract is up with Top Rank at the end of the year, and he already said in an interview this week that a fight against Floyd Mayweather Jr. will have to wait until 2015. This means we could be seeing Pacquiao moving on down the road from Top Rank after his September fight. As such, we’re likely going to see Mikey Garcia moved into position to be Pacquiao’s September opponent, if only in an effort to turn Mikey into a PPV star in the same way that Pacquiao’s fight against a weight drained Oscar De La Hoya in 2008 turned Pacquiao into a PPV star in the U.S. In other words, it could be the passing of the baton from Pacquiao to Mikey Garcia as Top Rank’s PPV star. If Pacquiao is going to be leaving Top Rank at the end of the year, then the Mikey vs. Pacquiao fight needs to take place in September. If Mikey looks good, it might work for Arum. But if he gets blown out like I think he will, then this fight will work out about as good as having other Top Rank fighters like Rios, Margarito, Miguel Cotto and Clottey face Pacquiao and getting beaten badly.